An article by Jaime Ortega Carrascal in La Vanguardia – translated by CPNN and reprinted for non-commercial purposes. A survivor of the Bojayá massacre, a FARC guerrilla who is about to leave his weapons or a peasant who stopped cultivating coca are some of the anonymous Colombians who found in the community radios the way to promote the peace thanks to support from the European Union (EU). 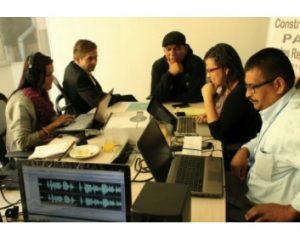 The initiative “Community Radios for Peace and Coexistence”, launched in mid-2016, supports 400 of the 627 community radio stations in Colombia to generate a culture of peace in the most remote rural areas, those most affected by the armed conflict. “This is very important because community broadcasters disseminate the expressions and feelings of those living in distant territories,” the EU ambassador to Colombia, Ana Paula Zacarias, told EFE. The EU allocated two million euros (about US $ 2.23 million) to this initiative promoted by the Cooperative Network of Community Media in Santander (Resander) with the support of the Colombian Presidency, the Ministries of Culture and ICT, The Office of the High Commissioner for Peace and the newspaper El Espectador. “The messages are adapting to the different regions,” added Zacarias, recalling that the “Fiesta Estéreo” station in Barrancas, in the Caribbean department of La Guajira, emits in Castilian and Wuayuunaiki, a language of the Wayú Indians who represent a high percentage of the population of the area and are distributed between Colombia and Venezuela. In the Wuayuunaiki language curiously there are no words like “peace” and “coexistence”, which is why in these programs they say it in Spanish. Building peace and providing post-conflict support after the agreement with the FARC guerrillas is the EU’s priority, which also emphasizes issues such as indigenous communities, children, gender equality and environmental protection. Journalism in Latin America: Is it turning towards a culture of peace? “All the guerrillas of the FARC are committed to the peace process and on our part we do not want to use words as a weapon”, says a guerrilla at the station “La Calidosa”, Policarpa, municipality of the department of Nariño, on the border With Ecuador. Policarpa houses one of the 26 temporary transitional zones of normalization in which about 7,000 FARC guerrillas will leave their weapons to return to life in society and that is why messages of reconciliation are very important among listeners of ” La Calidosa “. “We are sure that this project is one of those that is having an impact in the construction, in the transmission of the peace in the territories because the 400 radios can reach an audience of ten million listeners”, indicates Zacarías . At the same station, Juan, a peasant, tells how “violence has hit very hard” in the area and with his testimony advises listeners to return to traditional crops, such as coffee that for years was replaced by coca, which brought them nothing but misfortunes. “People came and were infusing what is called the cultivation of illicit uses … we went directly or indirectly, without realizing that we were hurting our families,” he says. The EU initiative not only opens microphones to the people, but also includes workshops in which 200 community radio journalists have been trained in the elaboration of educational content on peacebuilding, as well as 50 broadcasters receiving technical assistance and donations of recording equipment. The project is secured until next November, although the EU ambassador is of the opinion that this “does not mean that we can not in the future study other formulas to continue supporting this work of sending messages on peace to the territories” to promote reconciliation between the Colombians. An example of this is Noel, a singer-songwriter known as “El Negrito del Swing”, a survivor of the Bojayá massacre, the worst committed by the FARC, which on May 2, 2002 caused between 79 and 119 deaths when a bomb launched during a combat against paramilitaries fell in the church of that town of the department of the Chocó where hundreds of people had sought refuge.